This 2.7-mt. capacity super-duty garage floor jack offers a 533 mm max rise and low-profile design that’s perfect for professional shops and home garages. Fits most light-duty lifting applications. 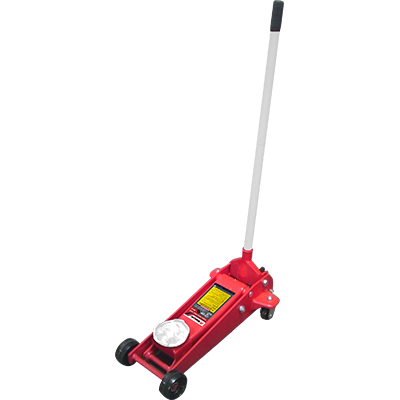 The RFJ-3T is a professional-grade garage floor jack that sports a 2,722-kg. maximum lifting capacity and flanged side plates for extra strength where you need it most. The specially designed flanged edges will grip the frame or lift point of your vehicle, preventing slippage and maximising safety. The power and rugged build of this model is obvious from its look-and-feel, but it’s the built-in safety features that really set this jack apart from the rest. Double-sealed hydraulics and a sturdy steel construction help to protect your investment, while the clever universal-joint release system and roller cam plunger assembly make operation a breeze. This floor jack is a bit more compact than some of our other designs, which is why we call its shape “racing style.” We understand that track day is one of the best days of your week, month or year. For that reason, we did everything in our power to make this floor jack easy to maneuver across long distances, like the race track. If space is tight or you need to minimise the footprint your equipment leaves in your shop, Ranger offers extremely high-quality floor jacks that are safe, reliable and fast-delivering at all times. Whatever your needs, Ranger offers a garage floor jack that fits your budget and is guaranteed to meet or exceed strict ANSI guidelines for safety. Be sure to pick up a set of Ranger jack stands. They’re lightweight enough to bring to the track and offer a quick, reliable means of securing your vehicle nearly two feet in the air.